Olives are small bitter oval fruits, green when unripe and black when ripe, used for food and for oil. They are native to the Mediterranean region of Europe. Olives cannot be eaten right off the tree; they require special processing to reduce their intrinsic bitterness, caused by the glycoside oleuropein, which is concentrated in their skin. Some olives are picked green and unripe, while others are allowed to fully ripen on the tree to a black color. While some processing methods expose unripe greens olives to the air, and the subsequent oxidation turns them to a dark color. 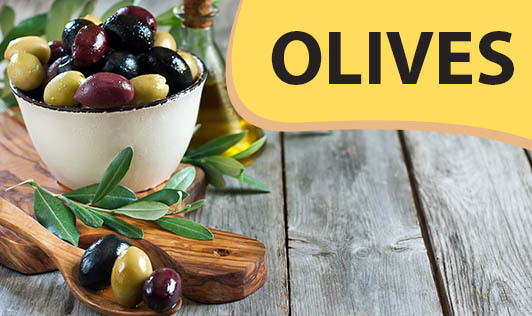 The color could also be affected by a variety of processing methods that olives undergo including fermentation and/or curing in oil, water, brine or salt which can turn it to black, purple, brown, red, or yellow. Olives are a very good source of monounsaturated fats and a good source of iron, vitamin E, copper, and dietary fiber. In addition, olives contain a variety of beneficial active phytonutrient compounds including polyphenols and flavonoids. • It can make a zesty addition to salads, meat and poultry dishes and, of course, pizza. • Olive tapenade is a delicious and easy-to-make spread that you can use as a dip, sandwich spread, or topping for fish and poultry. To make it, put pitted olives in a food processor with olive oil, garlic, and your favorite seasonings. • Toss pasta with chopped olives, tomatoes, garlic, olive oil and fresh herbs of your choice.